And the US flag goes Where? | The Kyudo Project Blog! 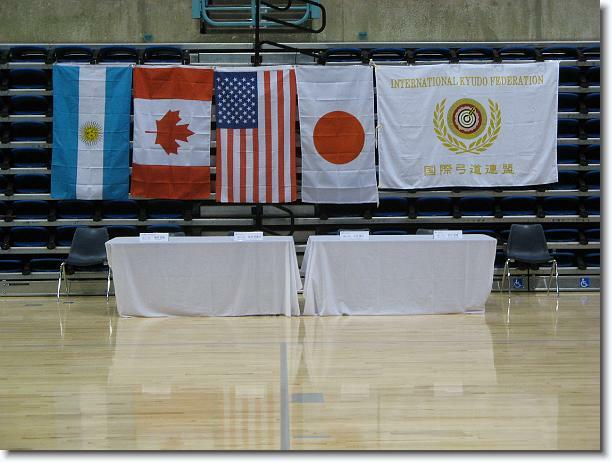 Kyudo USA 2008 was the largest American seminar ever due, in part, from the international participation. Several Canadians attended and three from Argentina (more from Argentina would have come if they could have obtained visas and passports in time). 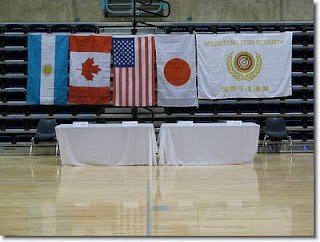 NANKA rolled out the red carpet/shomen by displaying the flags of Canada, Argentina, Japan, the All Nippon Kyudo Federation flag along with the US flag. The intentions were good but the execution was a bit off. As future seminars may have even more international attendance it becomes important to know the US flag code. You can read the highlights of the code here. 11. When flags of two or more nations are displayed, they are to be flown from separate staffs of the same height. The flags should be of approximately equal size. International usage forbids the display of the flag of one nation above that of another nation in time of peace. The order of precedence for flags generally is National flags (US first, then others in alphabetical order in English), State (host state first, then others in the order of admission) and territories (Washington DC, Puerto Rico, etc. ), Military (in order of establishment: Army, Marine Corps, Navy, Air Force, Coast Guard), then other. I hope to see even more country flags in future seminars!